Objects often transcend their functional roots to communicate with us through observation. 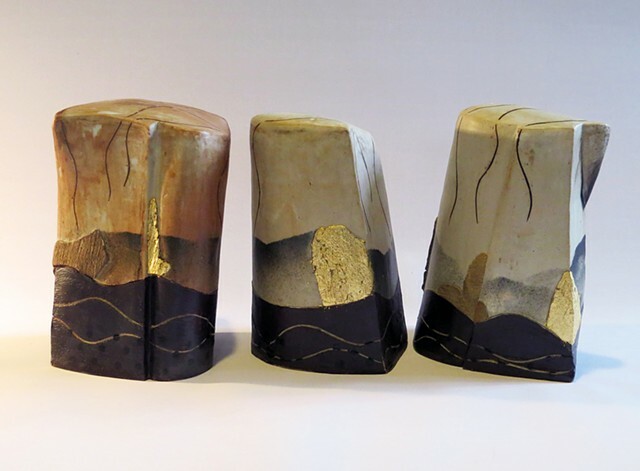 My ceramic pieces are inspired by my travels and are the result of my response to those cultures and the environment. I use a variety of stoneware and each type of clay comes with its unique personality and characteristics which allow me to respond to those properties. My interest in architecture, design and the Asian aesthetic are reflected in these hand-built, slab, and coil construction ceramic sculptures which are twice fired at about 2200 deg. F. The textured and patterned surfaces are the result of engraving, stamping, inlay and carving. Some pieces are burnished and gilded, while others have multiple applications of slips, stains and glazes. In my recent work I use mishima inlay, a centuries-old technique popularized in Korea. The form and surface of each piece are marked by my hand as well as the clay and the fire from the kiln.